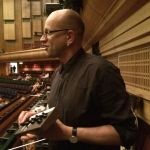 On the 19th July 2014, Robert Henke and Robin Fox performed at the Barbican in London (1). 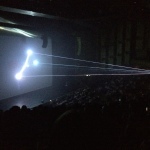 The audiovisual performances were very coherent, and complementary – both using lasers for the visuals. 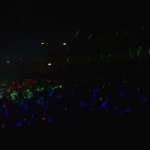 Robert Henke’s lasers were directed from the middle of the audience towards the screen, whereas Robin Fox’s were shot from the stage to the audience. Robert Henke’s lasers were monochromatic (mostly white), whereas Fox’s were in red, green and blue (as the name of the performance, RGB, implies). Robert Henke presented his latest show, Lumière. The name carries an interesting double meaning, pointing to light itself, but also to the origins of cinema and the Lumière brothers. The performance combined Henke’s trademark atmospheres and beats with minimal shapes (lines, squares, circles, lissajous curves), synchronised with sound. The show subverted the idea of projection on a screen, evoking notions of the origins of cinema and expanded cinema. It will be interesting to see where Henke will lead these explorations to in the future. 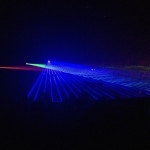 Robin Fox’s performance, RGB, was a masterful exploration of lasers as a tool for immersion – achieved not only by literally immersing the audience in lasers, but also by integrating tightly light and sound. Sound is generated using the same procedures used for laser manipulation, as Robin Fox explained to me afterward the show. One felt that the lasers were choreographed taking into the account the musical effect. 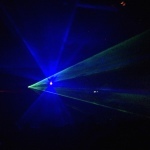 I was sitting on the left end of the audience, which gave me the chance, during Robin Fox’s performance, to gather multiple perspectives: to look into the lasers; to observe the laser trajectory; and to observe the audience being covered with laser light. This multi-layered experience was very enjoyable. I had the chance to have a quick word with the artists after the show, who shed some light (pardon the pun) over their technical approaches. The performances established an interesting dialogue with the Digital Revolution exhibition taking place at the Barbican at the same time (2), which also had sections incorporating lasers and focusing on audio-visual relationships.